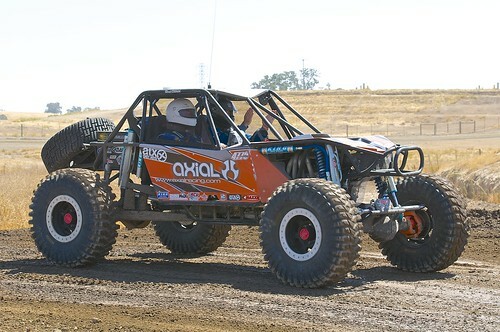 Axial Racing RTR vehicles come with either two types of motors, brushed or brushless. 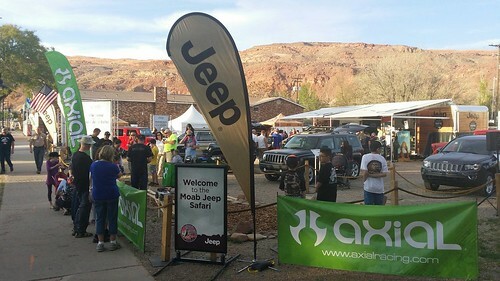 To better understand why Axial offers the two different types, it’s helpful to know the key differences between the two designs. As you’d expect, both designs have their key differences and their advantages. Brushed motors are the older technology of the motor world, but that doesn’t mean they don’t have their advantages. The biggest advantage is low cost. 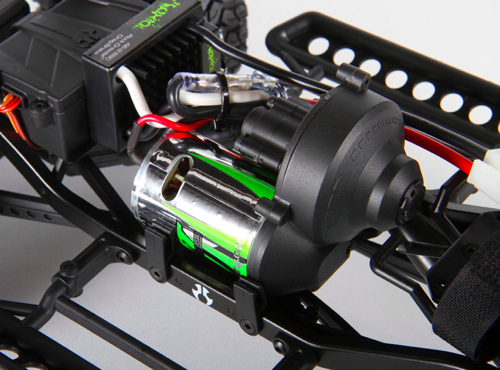 Brushed motors simply deliver a lot of bang for very little buck. 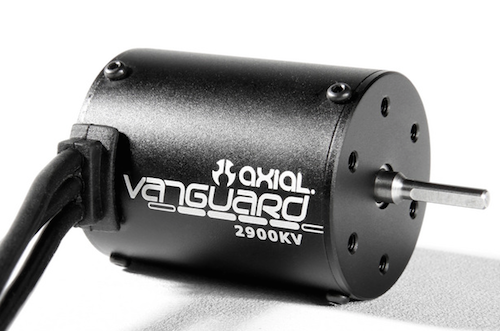 Brushed motors come in many versions; Axial uses a sealed end bell design with bronze bushings (as opposed to ball bearings). This setup is highly robust. So, what makes a brushed motor brushed? In simplest terms, brushes are hard conductors (one positive and one negative) that brush up against the spinning commutator in the center of the motor with positive and negative magnets on the inside of the can. 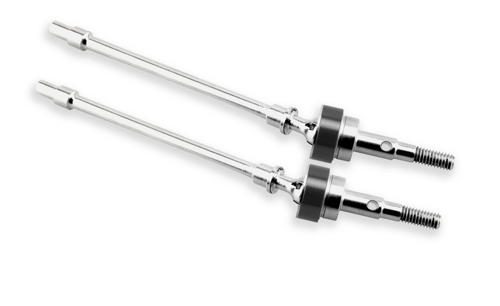 These brushes are a wear item as there is physical contact and the parts spin at an extremely high rate, but if the motor is kept dry and clean, it will last a very long time. Best of all, Axial’s brushed motors list for only $16 to $19, depending on the turn selected. 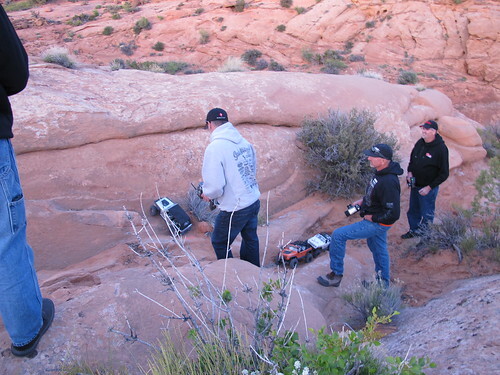 Another advantage of brushed motors is its throttle response. 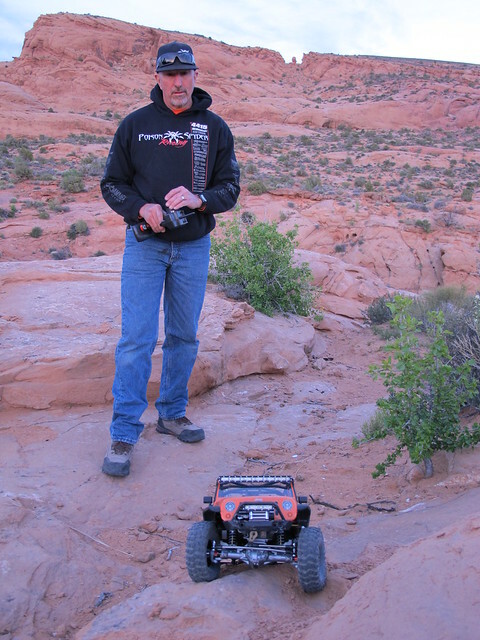 Brushed motors provide excellent slow speed control making them a great choice for rock crawlers where precise driving is key. 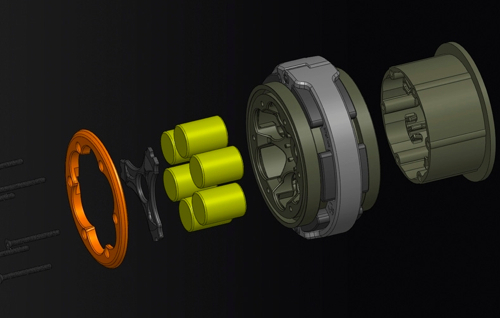 Brushless motors are basically built in the opposite manner of brushed motors. If you have a good understanding of brushed motors, think of brushless motors as the inside out version. The magnets spin and the coils of wire are inside the wall of the motor’s can or main casing. They don’t require brushes, and are thus appropriately known as brushless. An advantage of brushless motors is that they have a much longer lifespan since the main wear components have been eliminated. 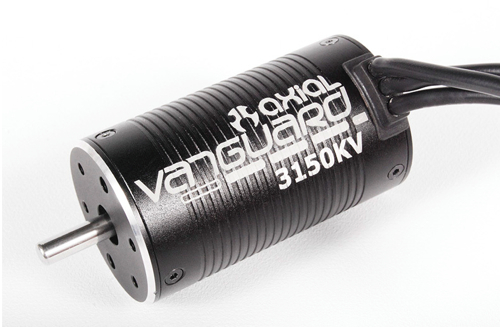 Brushless motors, such as the Vanguard 3150KV, are also more efficient, so they can provide best use of power (more runtime) and make more power. 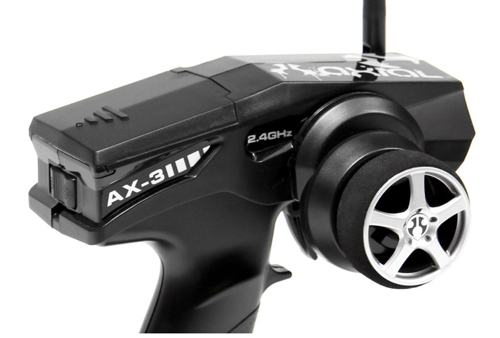 Axial currently offers two brushless motors. One is 2900KV and the other is 3150KV. 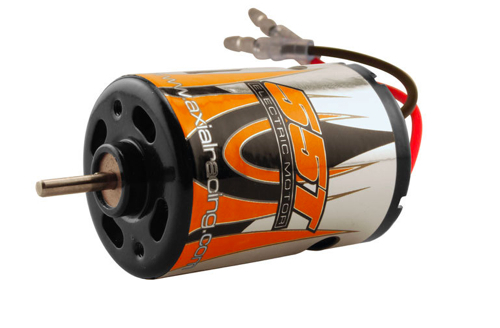 The higher the KV rating, the faster the motor. This is the opposite of how brushed motors are labeled. Brushed motors are typically labeled in turns, and the larger the number of turns, the slower the motor but more powerful the motor. 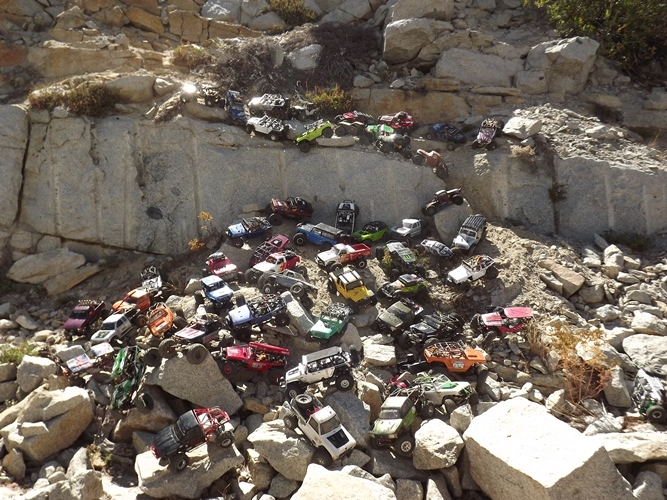 When you’re enjoying a trail run with your SCX10 or other Axial vehicle, the last thing you want is for a simple problem to end your day early. Going home before the fun ends is, well, no fun at all. The key is to be prepared when your adventure takes you away from the workbench. And, being prepared doesn’t mean taking your whole arsenal of tools and spare parts with you. 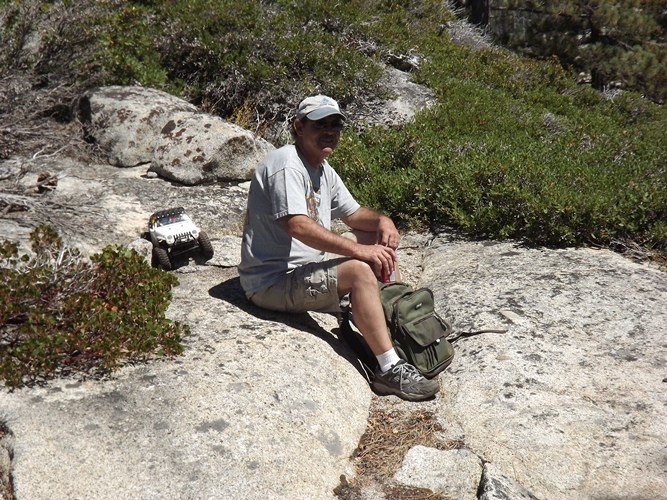 You can, in fact, pack light with a properly, and selectively, stocked field tool pack and still be more than ready for the typical field repair. 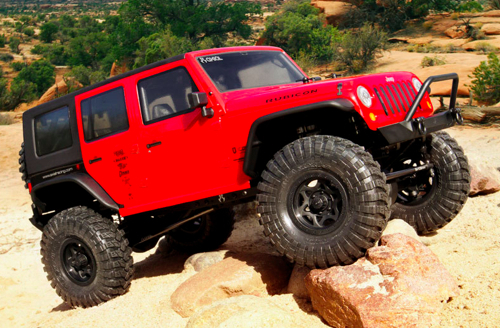 Here’s what you should have on hand for your next off-road excursion. First things first, you need somewhere to put your gear. You don’t need to get fancy when picking a field tool pack. Any inexpensive daypack will do. You may even have one at the bottom of your closet. 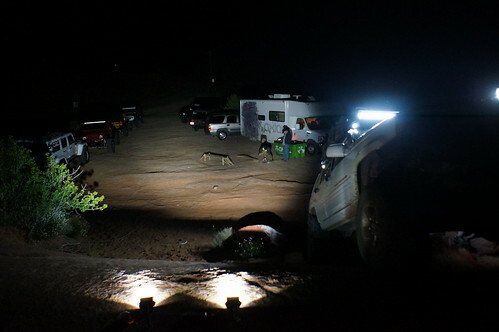 For an added measure of security, you can spray it will camping-style waterproofing, which help protect your items and also make it easier to clean. In addition to tightening the wheel nuts (you check those often, right? 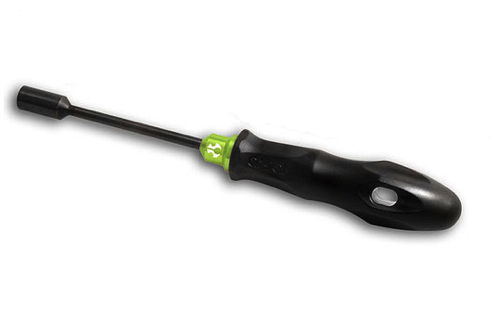 ), a 7mm socket driver is essential for removing the wheels, which is essential for many repairs. 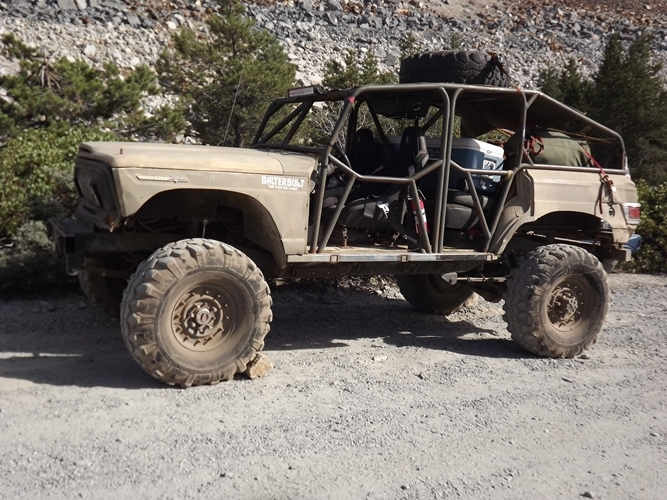 You could bring a half dozen or more wrenches with you, but that is hardly packing light. A complete set of wrenches doesn’t way that much by itself, but the idea is to have a pack that is so light that you don’t even know it’s there. 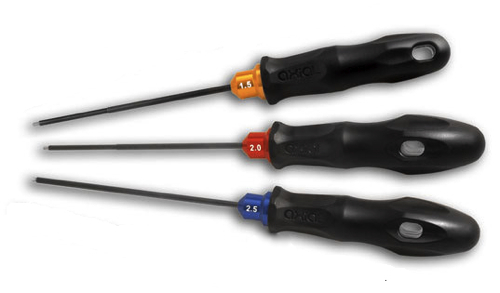 The three most often used wrenches are the 1.5, 2, and 2.5mm wrenches. 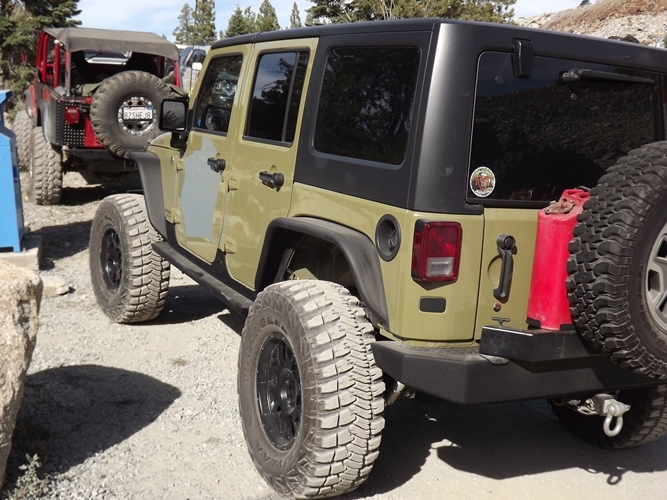 This will allow you to do everything from replace a driveshaft to swap in a steering knuckle. 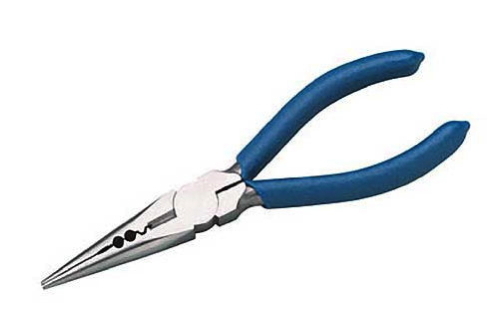 Instead of bringing a bunch of socket wrenches, a pair of needle-nose pliers will allow you to grasp most nuts while that hex screws thread into. Long pliers will make it easier to get into tight spots. A charger is one of the most important purchases you can make. As such, picking the right charger takes careful consideration. Price is important, but can’t be the only deciding factor. 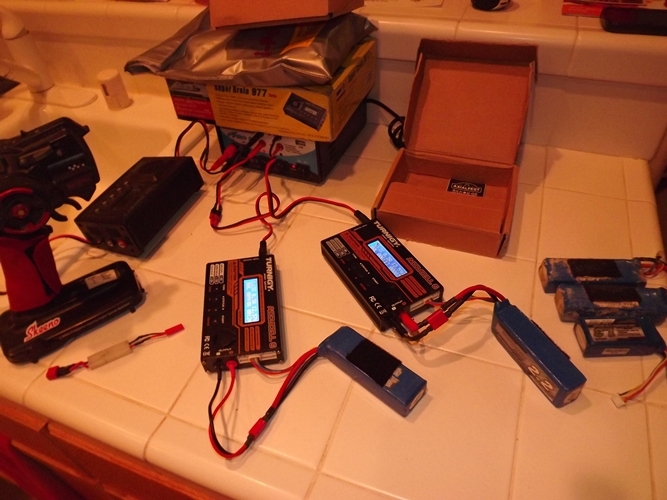 There are charges that can charge a variety of battery chemestries, but the two most critical for use in RC are LiPo and NiMH. 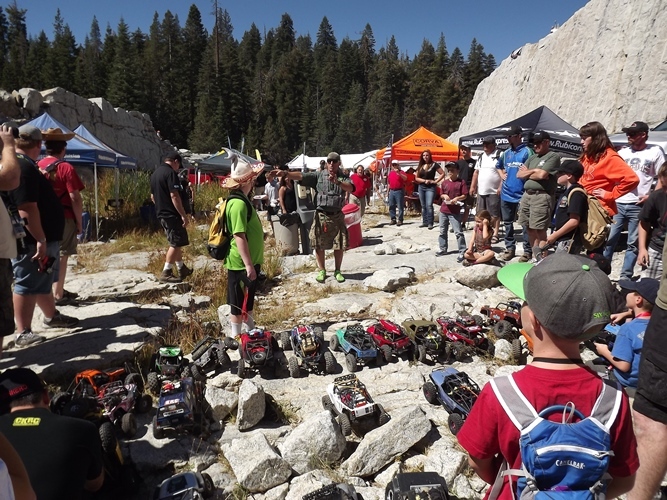 LiPo packs are currently the most popular and high performance technology. NiMH packs are older and heavier technology, but are less expensive. Both chemestries are still widely used, so it is recommended that you select a charger that can charge both chemestries. It is essential that you only use the specific mode for the battery type you wish to charge. 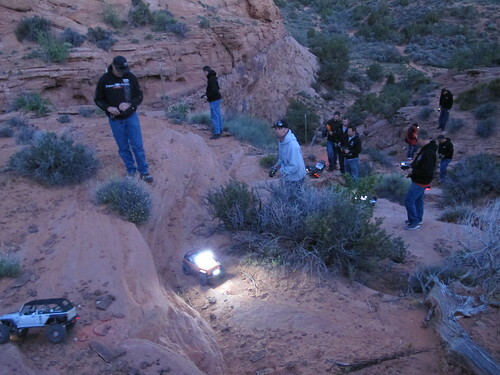 A LiPo pack must only be charged in LiPo mode–no exceptions. Also, confirm that the charger uses the CC/CV style of charging for LiPo. CC/CV means the charger charges at a constant current, say 5 amps, until a nearly fully charged voltage level is reached and then switches to maintaining that voltage by fluctuating the current. 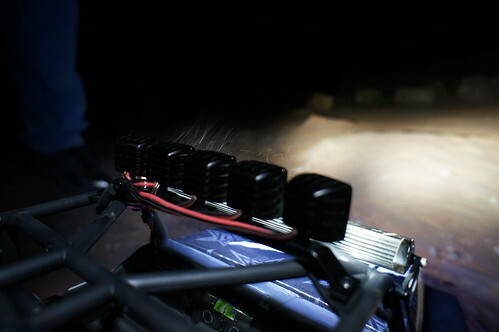 CC/CV is the only charging method Axial recommends for LiPo packs. Same for NiMH. 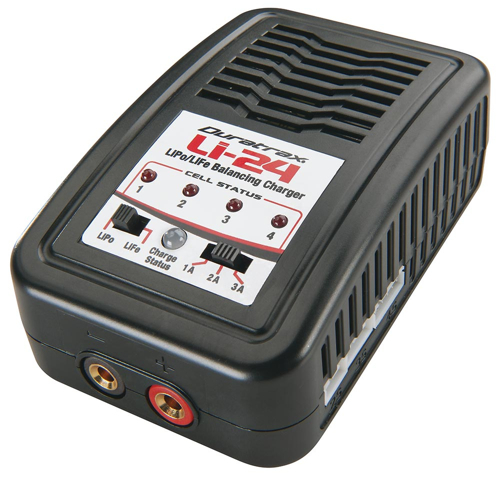 Even if you don’t own any LiPo packs, it is recommended that you purchase a LiPo capatable charger, so that you don’t have to purchase another charger when you do upgrade packs. Many people start off with NiMH packs to save money, but spend more money in the long run when they have to purchase a second charger. NiMH chargers do not command a strong resell value. It is also recommended that only a balance charger is used and that the pack (regardless of chemestry) is charged in a charging pouch. Chargers can be powered by either AC (house current), DC (12V battery or outlet) or both (AC/DC). Obviously, the latter is the most versatile, but is often bulkier and more expensive. While there are a few AC-only chargers, most are either DC-only or AC/DC. 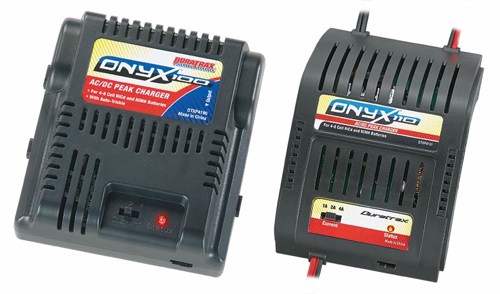 DC-only chargers can be powered at home via a 12-volt power supply, but that requires a separate purchase and space on your bench or RC work area. The main advantages of DC-only chargers is that they tend to be compact and are less expensive. The specifications of the power supply correlate to the charge rate specifications of the charger (see below). Not all chargers have LED screens, but if your budget allows, a screen is highly recommended. The larger the screen the better as it allows for far more clear display of information with fewer cryptic abbreviations for data. Backlit screens aren’t essential, but make outdoor viewing especially better. Backlit displays are generally easier to read in all lighting conditions, but if you only plan to use your charger in a darker basement or garage type work area, it is a feature you could live without if need be. Charge rate refers to the amperage (amps), a measurement of electrical current, a charger can deliver to a battery. 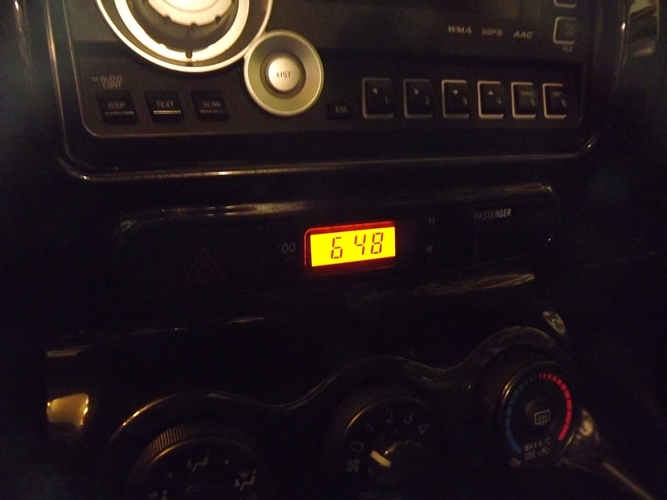 The higher the amps, the less time it takes to charge. You cannot simply charge at the highest rate possible, however. NiMH packs should be charged at 5 amps or less. LiPo packs are recommended to be charged at 1C or 2C and to always be charged in balance mode with the battery in a charging bag/sack for safety. 1C is one times the battery’s capacity, which would equal 5 amps for a common 5000 mAh battery pack, 4 amps for a 4000 mAh pack, 3.2 amps for a 3200 mAh pack, etc. 2C is two times the capacity, and thus, a 10 amp charge rate for a 5000 mAh pack. Knowing what size batteries you plan to charge most often will make picking the right charger much easier. The key (and sometimes harder information to find) is understanding how much power (watts) a charger’s power supply can deliver. 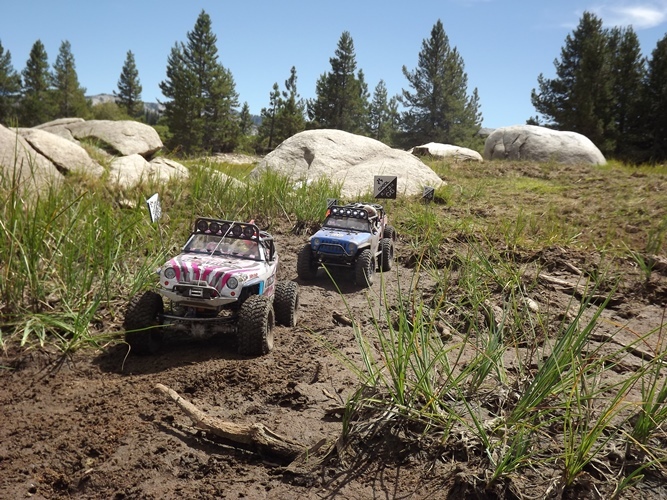 This is especially important if you have an Axial Yeti, EXO Terra Buggy or an SCX10 equipped with the 3S-capable AE-5 speed control and you’re using, or plan to use, 3S LiPo packs, which are 11.1 volt packs and require significantly more power from a charger’s power supply to charge at the same rate used for a 2S (7.4V) pack. If a charger doesn’t have enough power (watts) it won’t be able to charge at the amperage level you want. 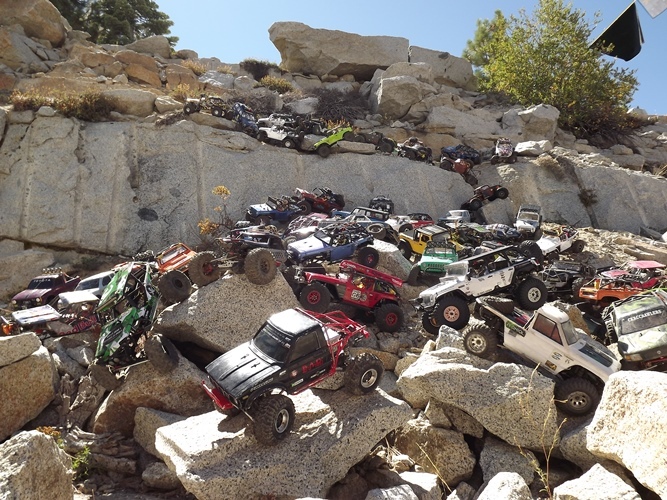 This really isn’t a significant concern if you’re charging a few LiPo packs for a day’s worth of rock crawling, but if you are rock racing your Yeti and need to charge a 3S pack between rounds, it can be critical. If you have a charger with a 50W built-in power supply, it won’t be able to charge a 3S 5000 mAh LiPo pack at 5 amps. To calculate how many watts are needed, multiply the charge rate by the pack’s voltage. In the 3S 5000 mAh example, the equation is 5 amps multiplied by 11.1V for a wattage requirement of 55.5 watts (5×11.1=55.5). Technically, 11.1 is the nominal voltage and 12.6 is the fully charged voltage, so if 12.6 is used, the maximum wattage requirement is 63 watts. Have you ever heard the saying that an ounce of prevention is worth a pound of cure? This is profoundly true when it comes to RC. A little prevention–a quick once over, really–will go a long way towards ensuring nothing goes wrong when you least want it to. 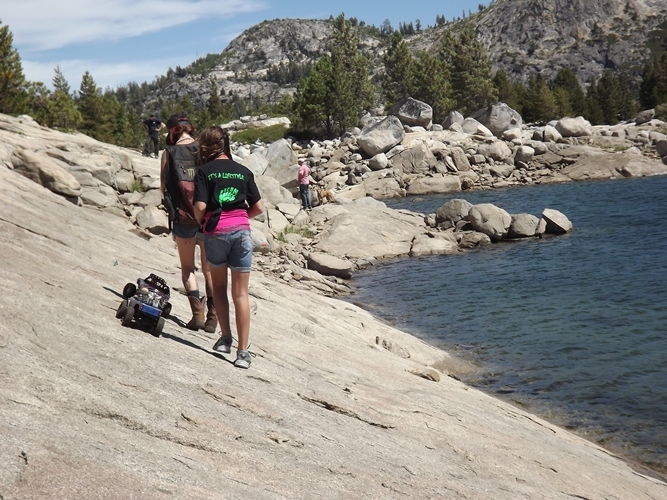 Here are the items you’ll want to quickly check before hitting the trail. It seems simple, but many people only tighten the nuts holding their wheels when doing maintenance that requires removing and reinstalling the wheels. Don’t wait until doing something where you have to take the wheels off to make sure they are properly tightened. 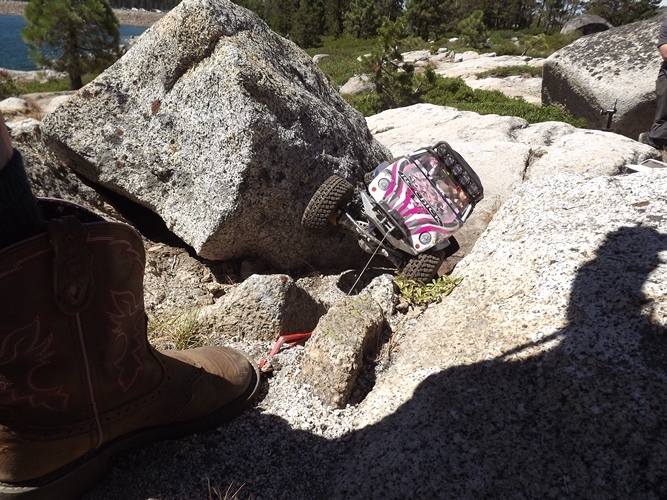 Loose wheels can lead to ruined drive hexes and wheels. 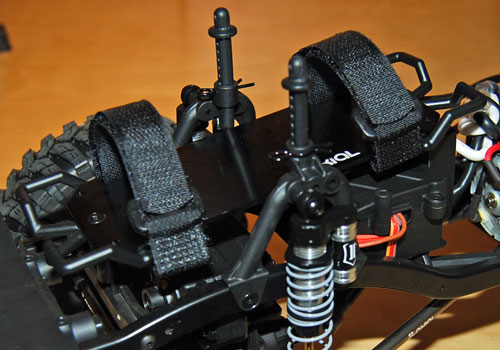 The wiring on your Axial Racing vehicle needs to be secure. Cable tires should be used to make sure wires are kept away from moving and hot components such as driveshafts and the motor. 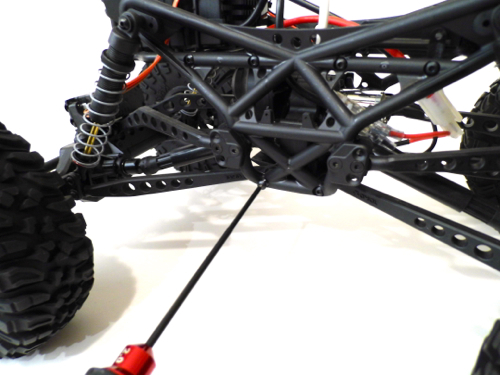 While the wires should be kept slightly loose to allow for movement as the chassis twists, the wires shouldn’t be too loose that they can rub on obstacles that rise up into the chassis or get snagged on branches. 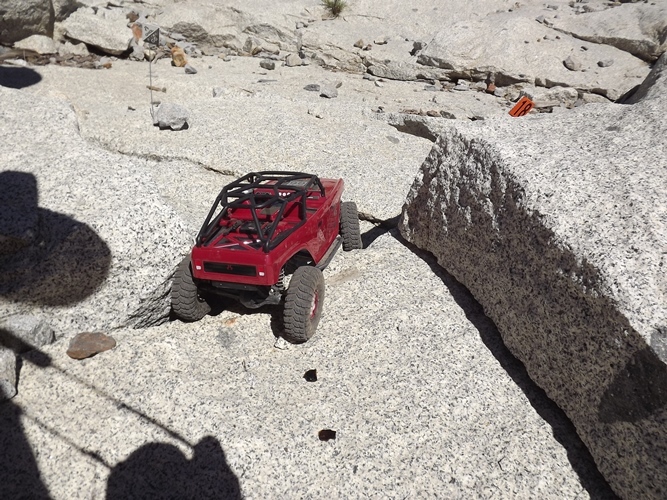 Notice that the SCX10 is equipped with clips on the side of the chassis to keep the wires out of harm’s way and still allow the wires to move as needed. While a visual check is best, taking the gear cover off can take more time than you’d like. The best tool for a pre-run gearing check is your ear. 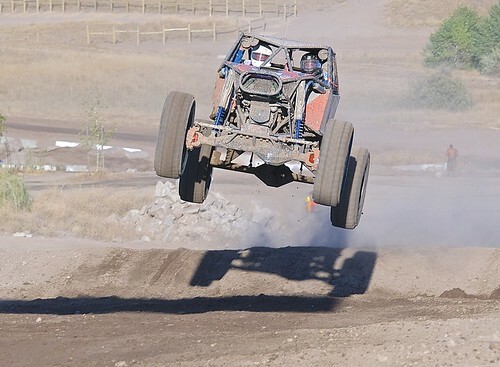 Hold your Axial vehicle while applying a small amount of throttle. Listen carefully for any grinding noise or anything but smooth gear engagement. 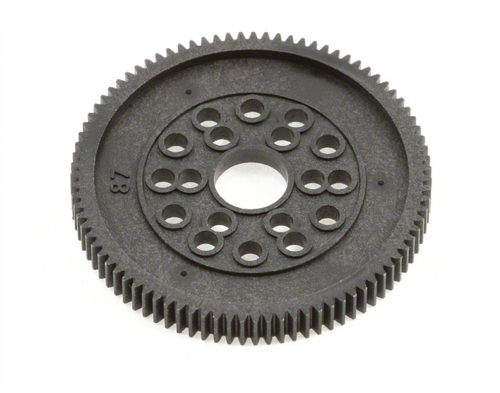 Any excessive noise can mean there is debris in the teeth of the gears, a gear is damaged, or the gear mesh is off. The slipper clutch is a wear item. Check to make sure that it hasn’t loosened. Occasionally after extreme use, a tighter setting will be needed to achieve the same results as when the parts are brand new. 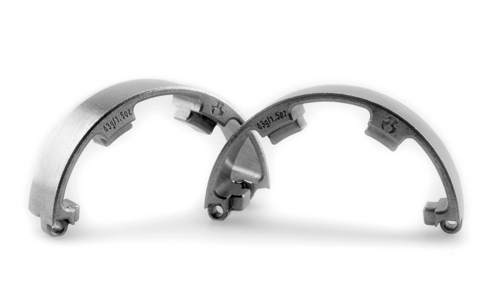 For complete maintenance, the parts (specifically the slipper pad AX30412) can be cleaned and replaced as needed, but before a run, slightly tightening the retaining nut can restore the desired amount of slip. A slipper that is too loose will often make a noticeable squeal. Only tighten the nut if you notice slippage. If the slipper is too tight, it won’t be able to protect your drivetrain. 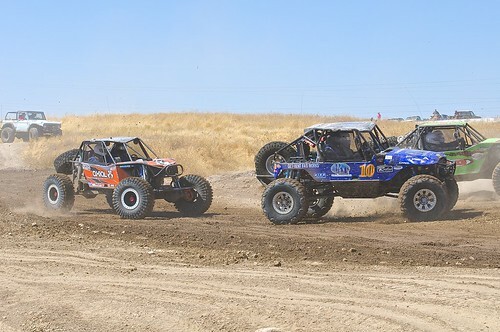 Check for excessive buildup of grime on the shocks. Examine the shock caps and the bottom of the shock body. 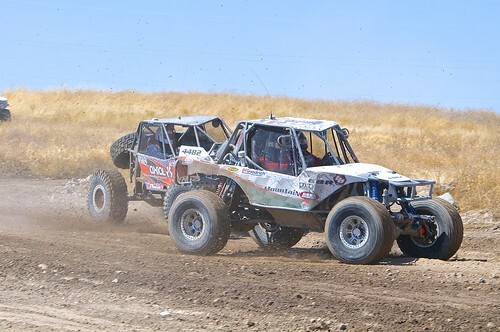 Dirt will naturally be attracted to these areas, especially where the shaft exits the shock body, but an excessive amount of accumulation can indicate a shock that has leaked out too much oil. A quick refill will most likely get you through the day, but a shock rebuild may be needed soon. Before a run, quickly go through the vehicle and look for loose hardware. 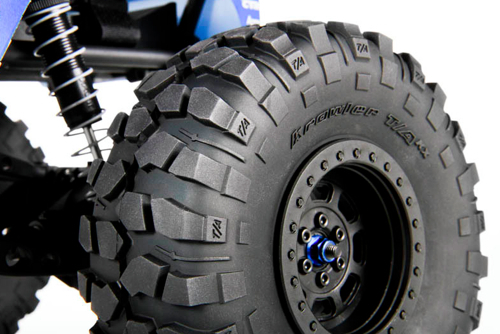 Check the steering knuckles where they attach to the axle C ends. Check the set screws for the driveshafts. Also, check where the C ends attach to the front axle tubes. Don’t over-tighten the hardware. You only need to make sure the screws are properly snug and aren’t loose. Don’t let transmitter batteries die at the worst time possible. Check and replace them before you go out. 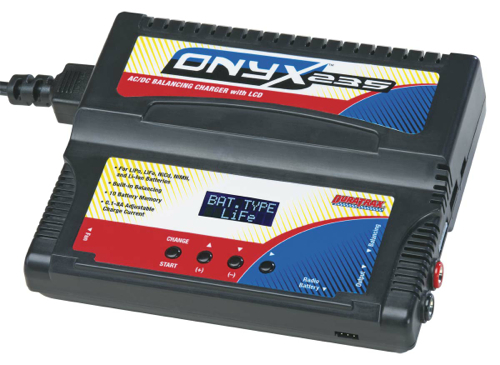 Axial transmitters use state-of-the-art 2.4GHz that has low current draw and only requires four AA batteries, so the batteries last a long time. 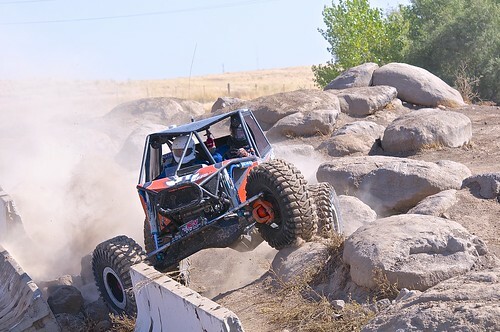 The Axial WB8 Wild Boar driveshafts are extremely strong and one of the most advanced designs offered, but they still must be periodically checked. Examine that the end pieces haven’t loosened and check that the splines have been twisted. 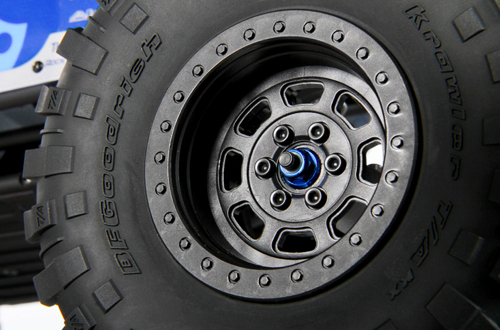 Whether you use bead locks or glued tires on your Axial, check the beads on all four tires to make sure they are attached properly. If a bead lock has pulled apart, you will need to completely remove the retaining ring and reassemble. Glued tires can be re-glued with RC specific CA glue after being thoroughly cleaned with a cleaner such as rubbing alcohol. 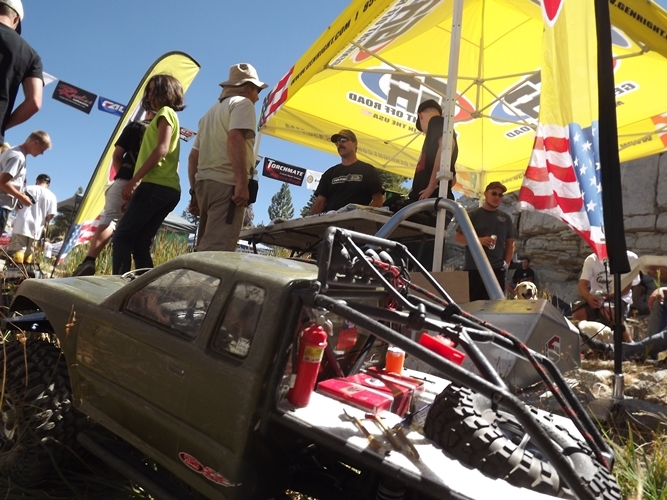 Want your Axial Racing vehicle to be the king of hill? Of course you do. 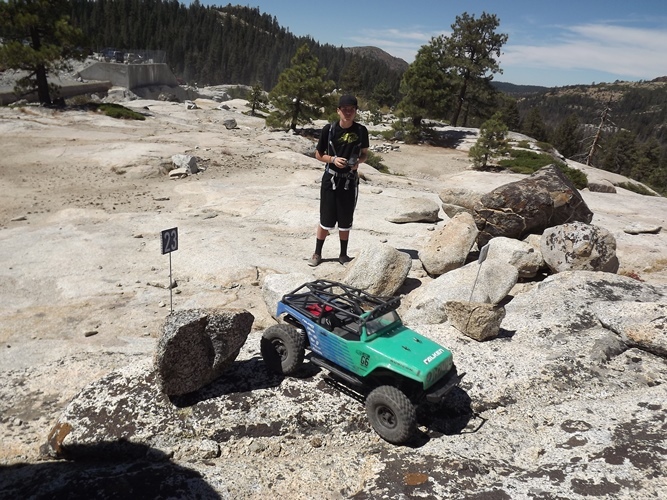 Follow these steps and you can take your SCX10, Deadbolt, or Wraith to the next level and dominate the competition. Your truck’s tires are its connection to the ground. If the tires don’t work, nothing else in your setup really matters. 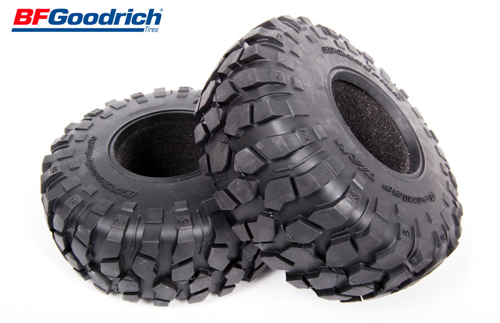 Tire considerations are size, compound, tread design, and foam insert. 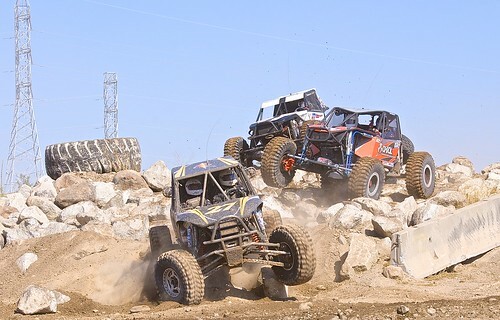 You can learn more about Axial Racing’s tires here and about choosing the right tires here. 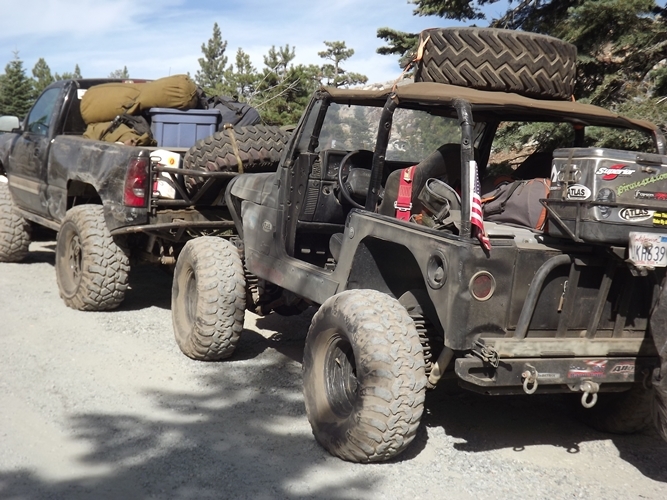 You can learn about gearing and how it relates to different tire sizes here. 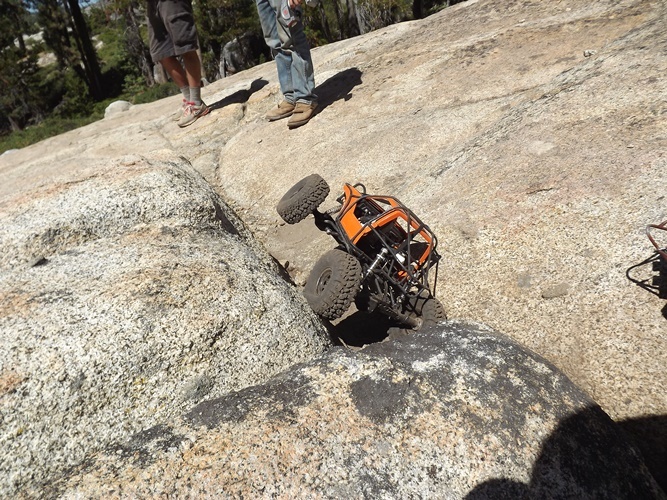 Lowering your crawler’s center of gravity (CG) should be a priority. 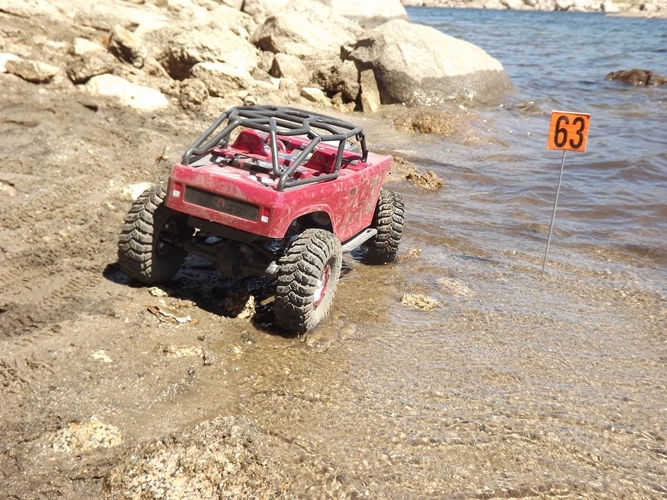 Look at your Axial Racing vehicle from the side and imagine a horizontal line going the length of the vehicle. Your center of gravity may be above or below the line depending on your setup. 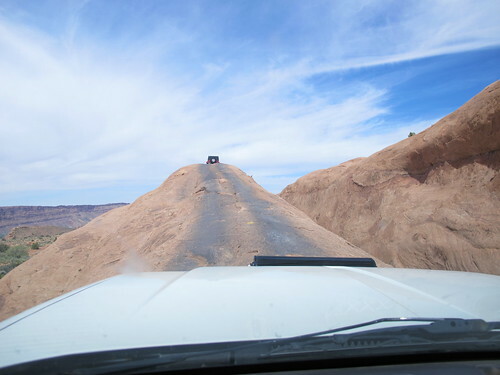 A vehicle with too much weight above this imaginary line will be top heavy and its off-road performance will suffer. The lower your center of gravity, the better. If you add scale accessories to your vehicle, the CG may be raised and your vehicle may be more tippy. The easiest way to significantly lower your CG is switch to aluminum wheels and to add Axial Racing’s aluminum knuckles and C-hubs. Much like CG, weight distribution greatly impacts performance. 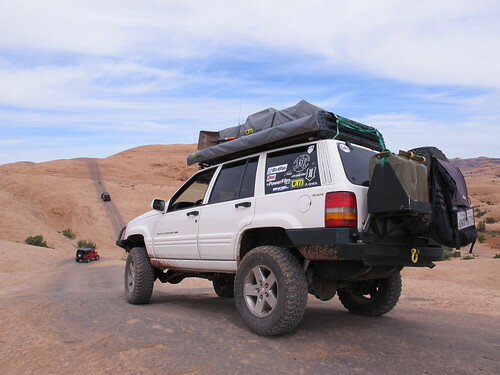 In addition to making sure your vehicle’s CG is as low as possible, moving weight forward will significantly improve your vehicle’s climbing ability. 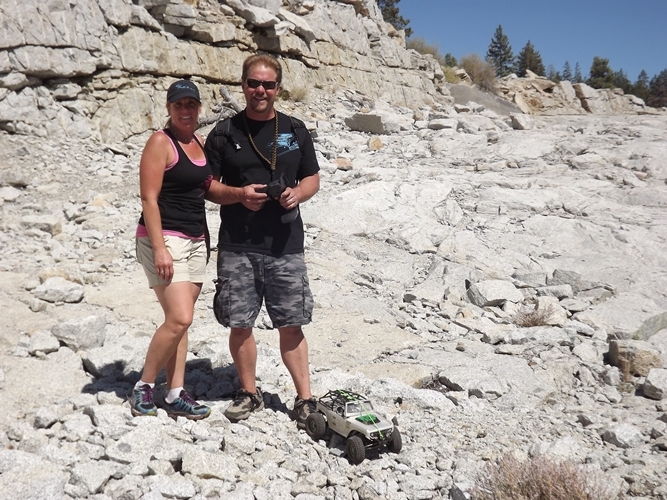 You can learn how to move the battery on an SCX10 here. The aluminum knuckles and C-hubs mentioned above also add weight to the forward portion of the vehicle and improve weight distribution. 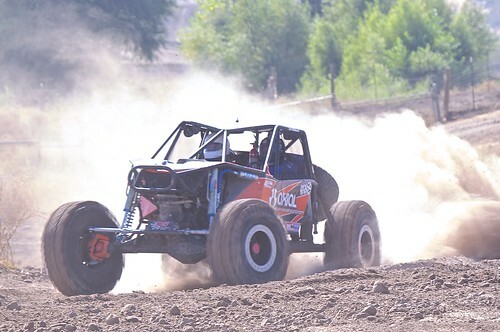 The steering components on your Axial Racing vehicle take the brunt of the abuse you subject the vehicle to. 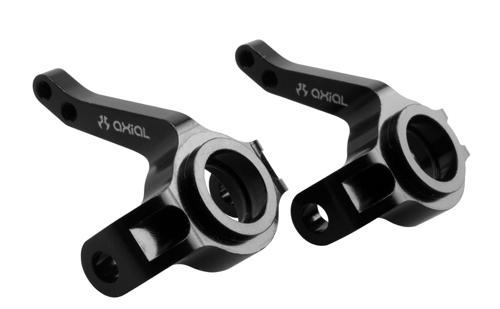 The above mentioned Axial Racing aluminum knuckles and C-hubs that help with CG and weight distribution do even more for increasing durability. 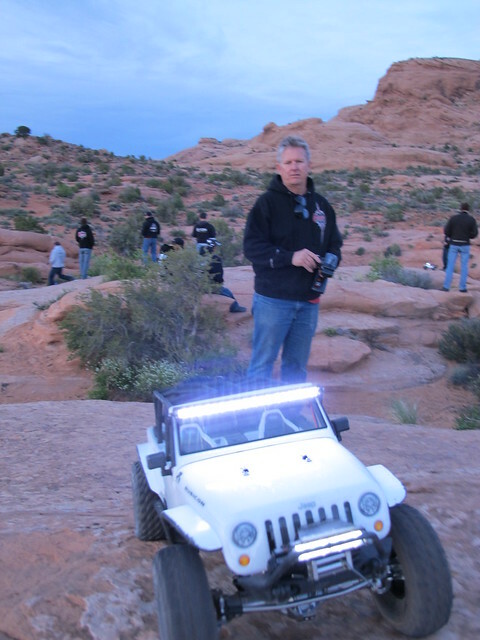 Add in an Axial Racing aluminum servo horn and your steering will be able to take an impressive amount of abuse. 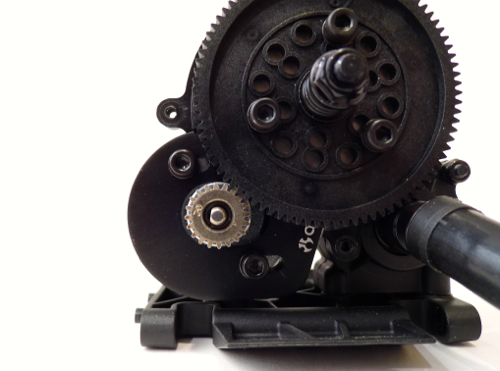 A metal gear servo is also recommended for a completely bulletproof steering system. 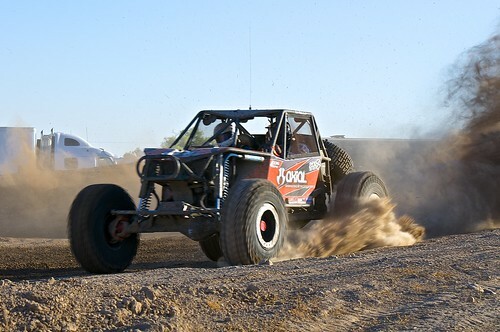 Axial Racing aluminum knuckles have been mentioned numerous times already, but another benefit is their design offers increased steering throw. 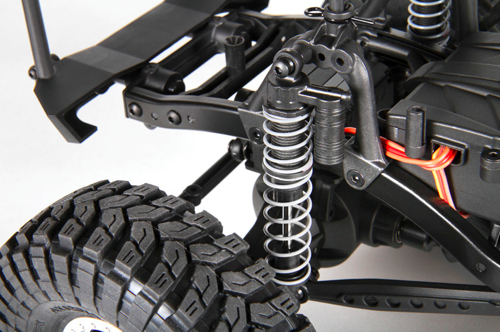 To really exploit the design of the knuckles, Axial Racing universal axles will allow for a substantial increase in steering. 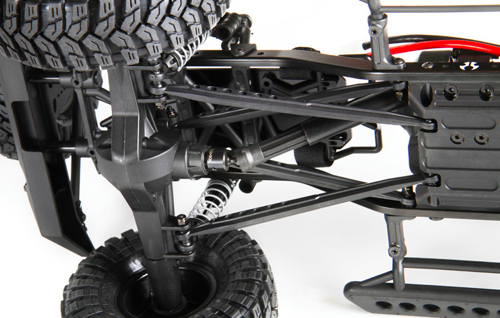 The universal axles are also more durable than the stock parts. 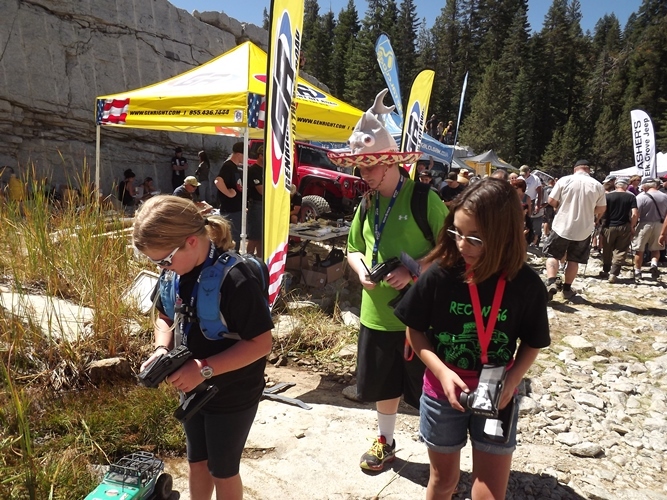 Every year the Rubicon Trail Foundation holds its fundraiser to support its efforts To Enhance the Future Health and Use of the Rubicon Trail while Ensuring Responsible Motorized Year-round Trail Access. 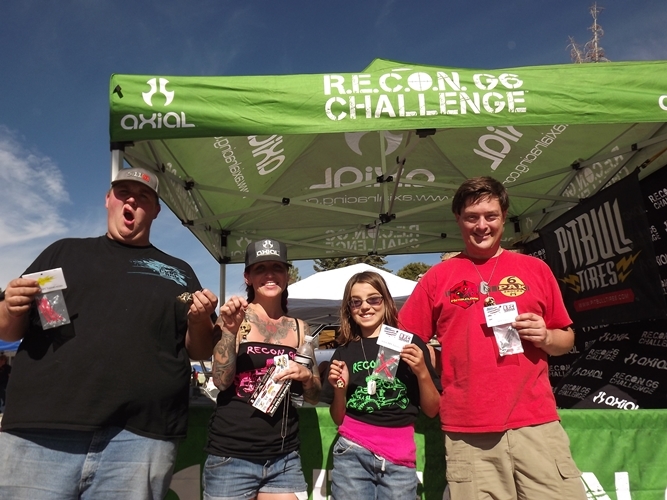 Last year RECON G6 attended and it was such a hit that it was asked to return to provide another RECON G6 for the event. The G Train packed up and made the trip. The Skeenos tagged along to see what the Cantina For The Con was all about. We got charged up the night before. You gotta be prepared for a RECON G6. Don’t show up with one battery, because you will need more than one. We got an early start. The drive was about three hours from Skeeno Central. 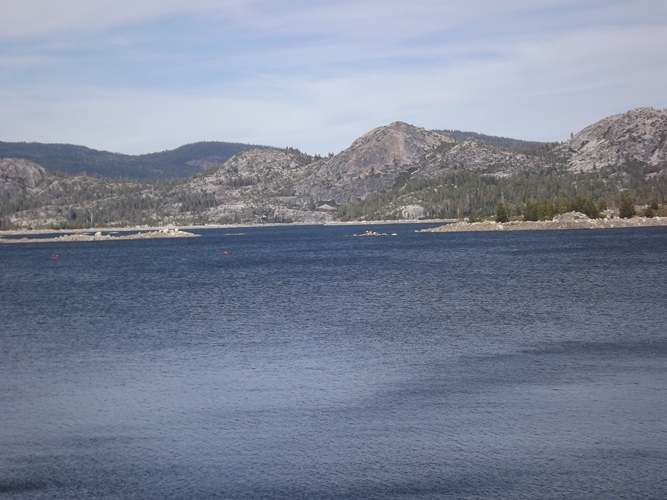 When we finally arrived, we were a little surprised at the size of Loon Lake. 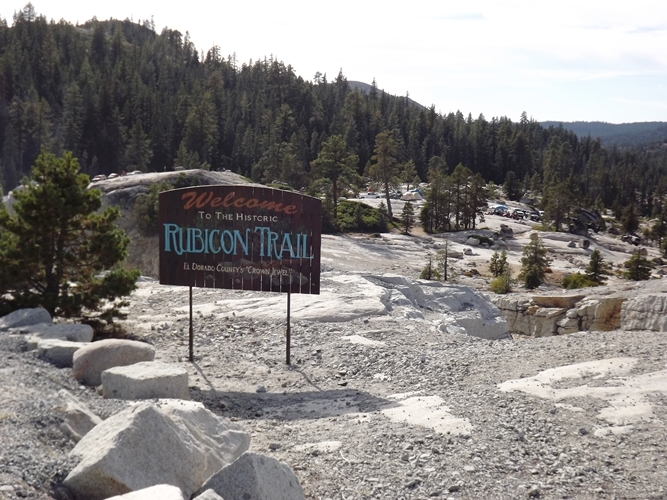 This was my first trip to the Rubicon in about 20 years. The water looked pretty inviting. I kinda wanted to jump in. Just when I thought we might be lost, I looked over the edge of the road and spotted this. It looked like we had found the right spot. Yup, that’s the sign we were looking for. See that little guy down there? That’s Parker getting ready. He’s setting up the trail markers. EZ-UPs, this had to be the place. 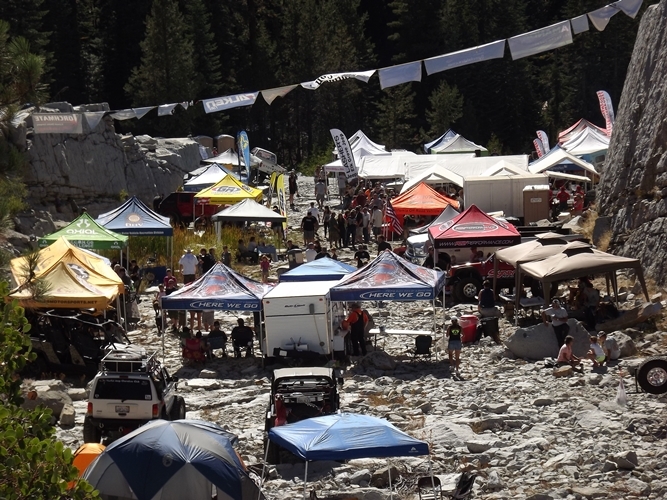 I think I see the RECON G6/ Axial tent. The parking lot was filled with tons of cool 1:1s. Parker made me include this picture. 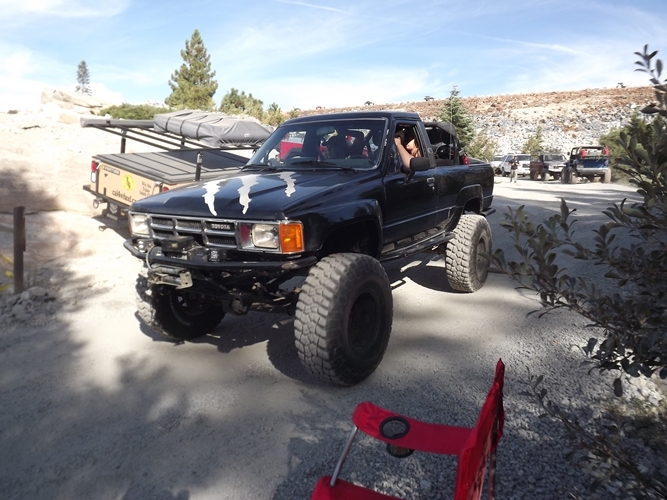 He loves Yotas. I personally preferred the 1:1s that had a little more personality. This old Jeep caught my eye. 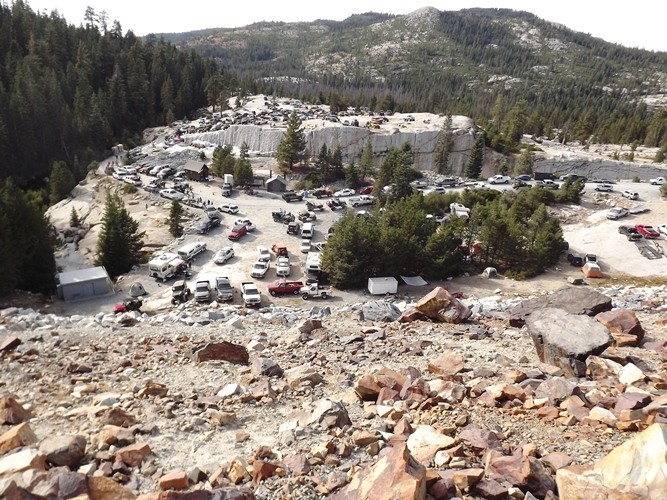 Lots of the rigs were loaded for camping. 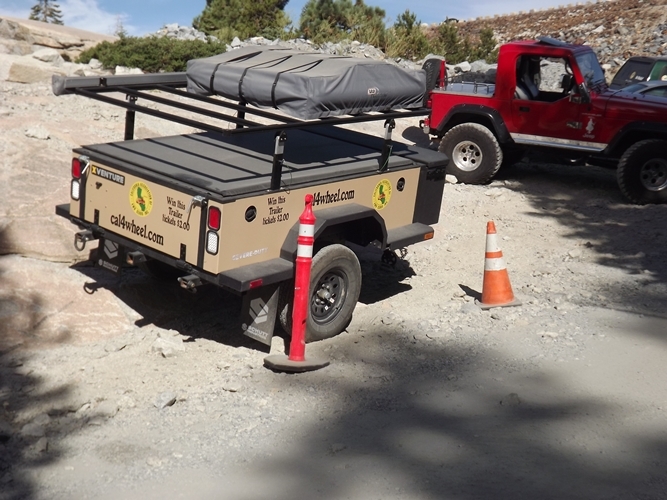 Speaking of camping, this sweet overland trailer was a raffle prize. I wonder which lucky duck got to take this bad boy home. This GM product had a bit of rock rash. I could see its owner wasn’t afraid to use it properly. 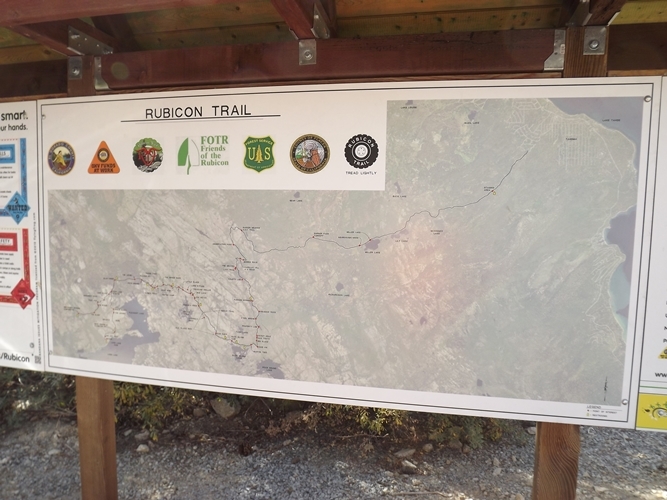 Here’s a map of the Rubicon Trail. 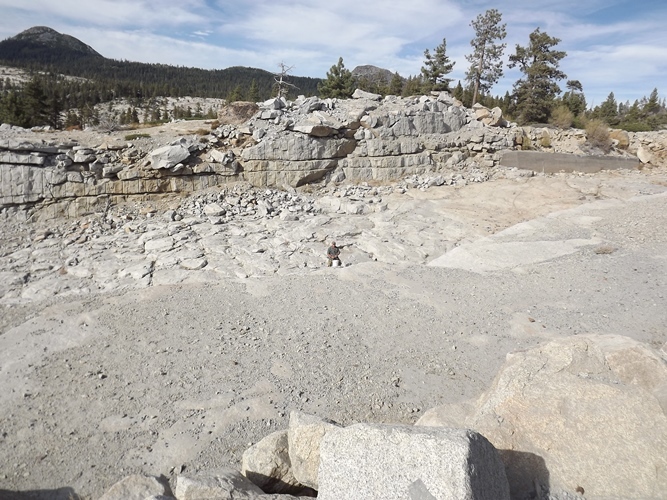 It included all the major features of the trail. 1:10 emulates 1:1, just like in RC, in the 1:1 world, you can build or you can buy. 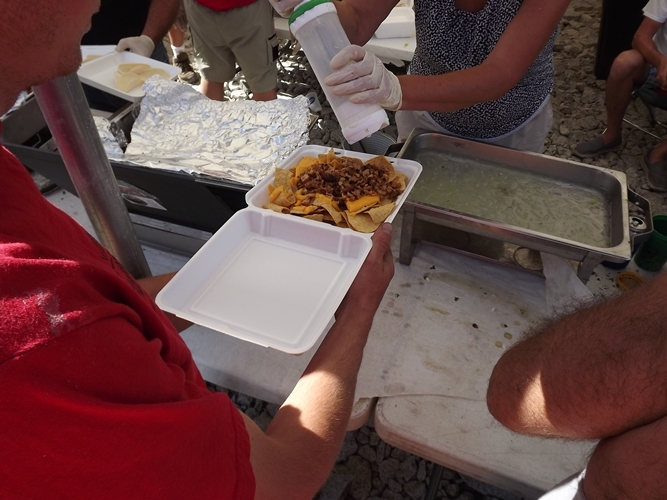 Once I turned into the Spillway area, I saw what everyone came for, the Cantina. You could get tacos and nachos. 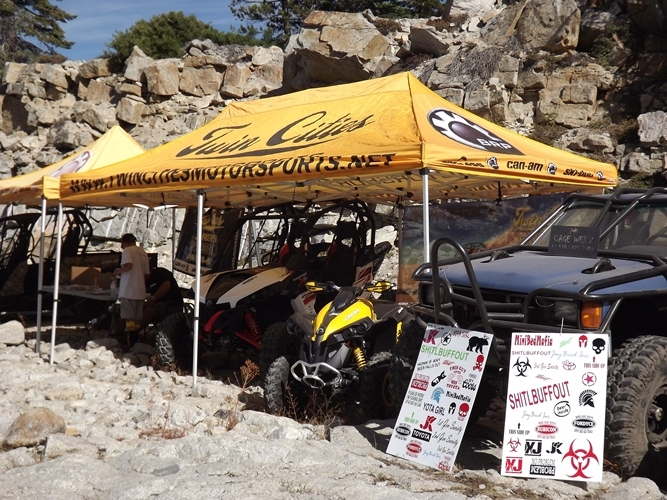 All proceeds went to the Rubicon Trail Foundation. 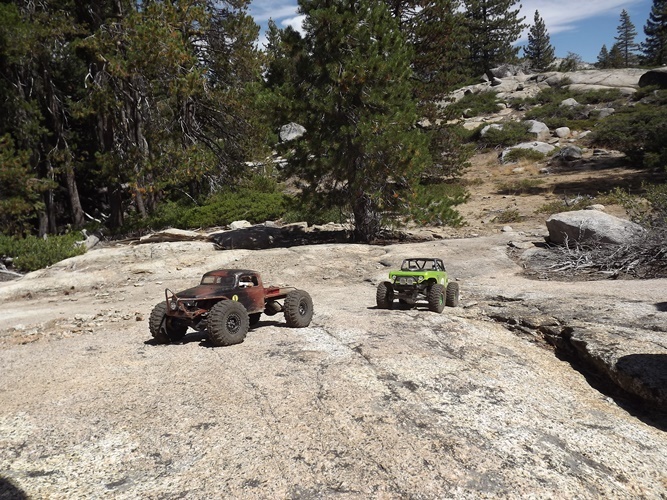 It’s a tasty way to support the World Famous Rubicon Trail and ensure it stays open for many more generations of off-roaders to enjoy. 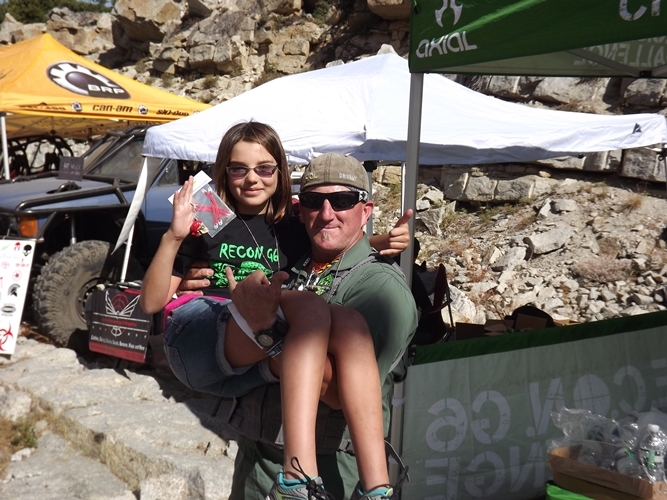 The beautiful and charming RC Chick was manning the RECON G6 tent when I showed up. I also saw an old friend, Werty. He runs WertyMade Products. 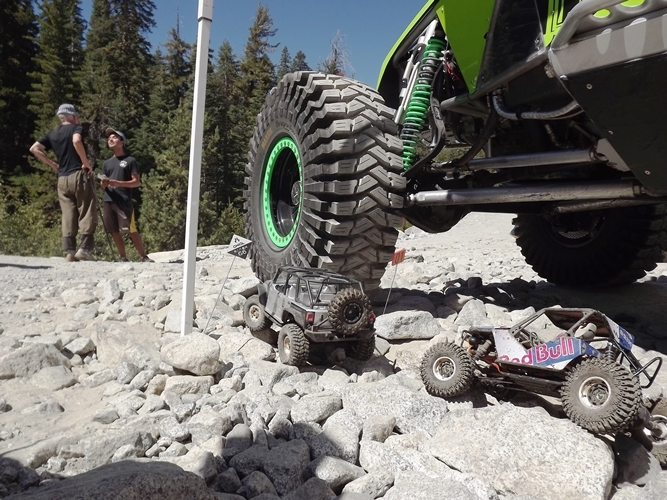 He wanted to make sure I put his picture in this blog to prove he’s a big deal in the RC world. After checking in, all the drivers posed for this group shot. Thanks to Elio and Rivas for arranging them so neatly. 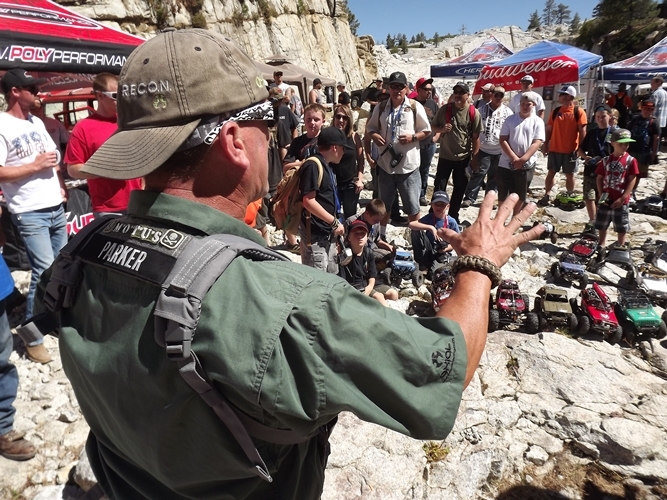 Of course, Parker had to explain the special rules and features of this RECON G6 to the drivers. No H.O.G. (Hand Of God) is the most important rule. Keep it scale. 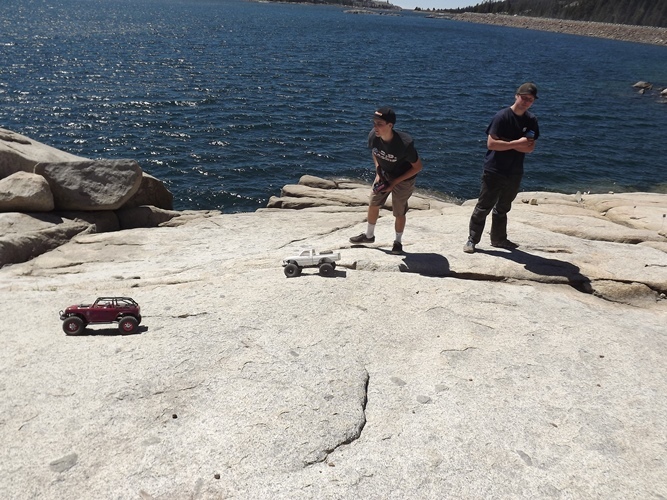 The first part of the RECON G6 was a few laps in the spillway to show off how cool RC is. 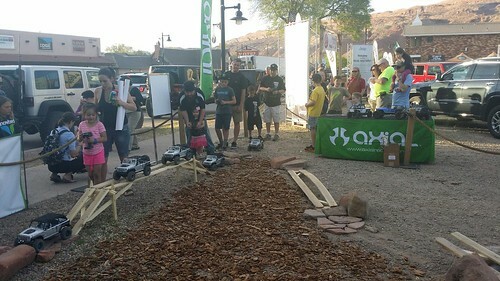 The crowd was a little surprised to see so many RC trucks cruising by. 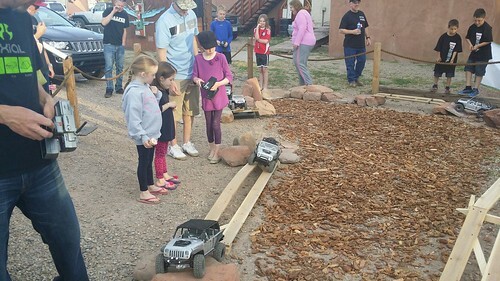 It’s always fun to see the little ones driving. Here Skeeno Jr drives with some of her contemporaries. 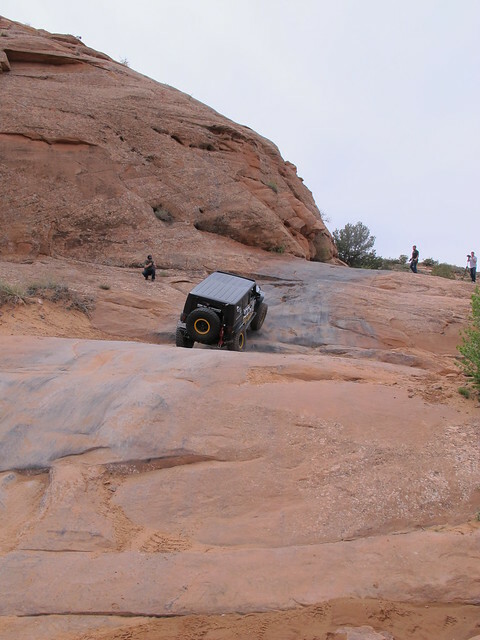 After a few laps around, we made our way up and out of the spillway. I was trying out my new Deadbolt body. This thing is cool. 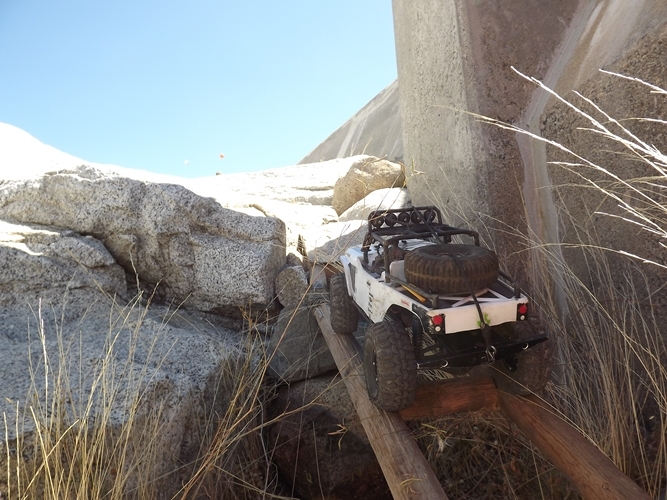 This bridge led to the fun stuff. 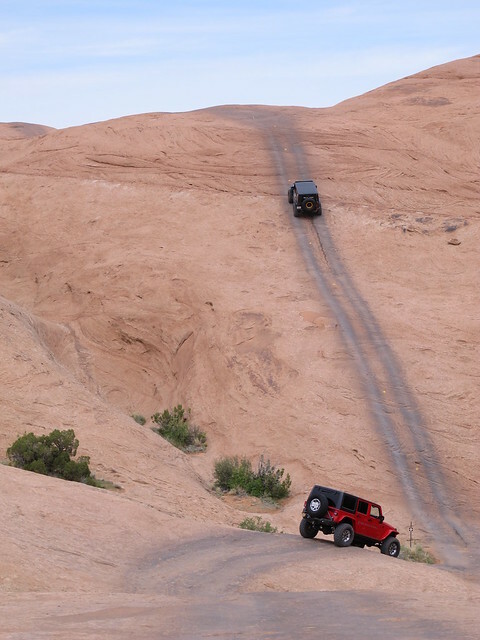 This guy takes his Falken G6 Jeep to the top of the spillway. 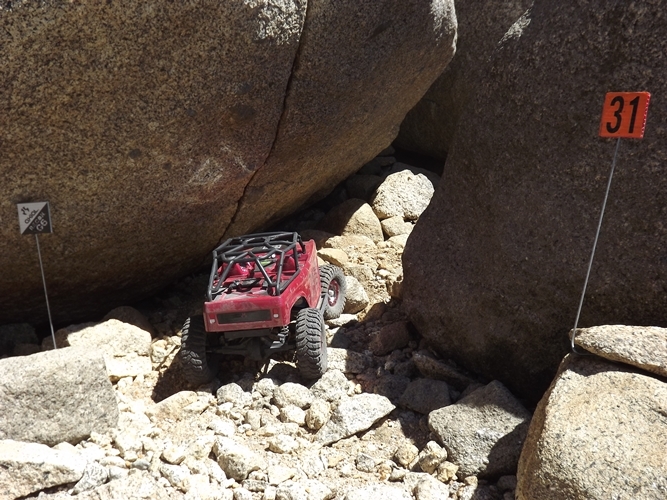 There were some boulders to drive under. This guy tried to copy my style by jumping off a ledge. It’s not quite scale but was effective for me. He didn’t fare as well. He needed to do some trail repairs after his ill-fated jump. I don’t recommend this technique unless you carry lots of parts at a RECON G6. 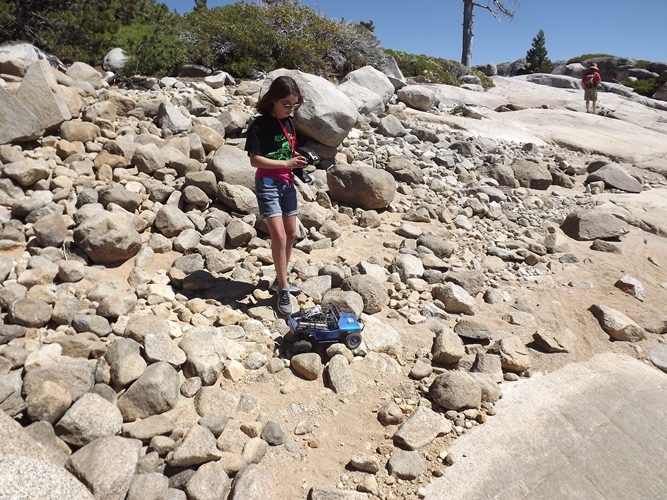 These little rocks proved challenging for Skeeno Jr.
RC Chick drove with us all day. 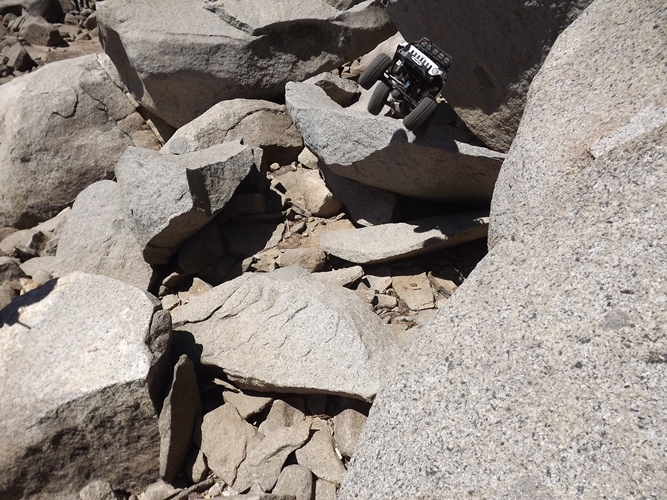 Here she used the Pull Pal RW60, the official land anchor of the RECON G6, to get up a nasty steep crack. RECON G6′s can be long walks. 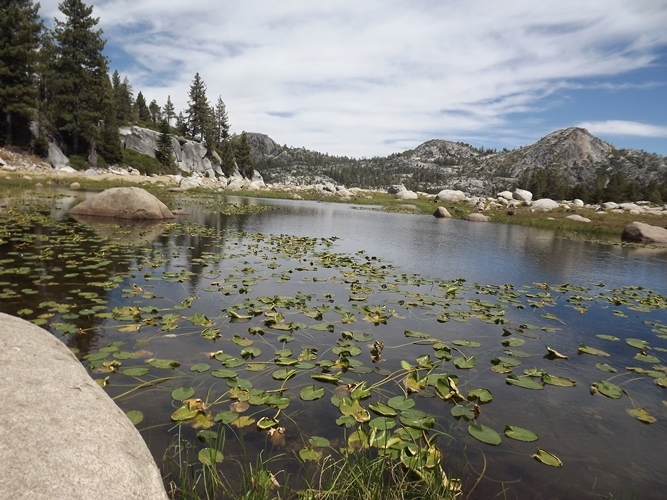 Be prepared with water and snacks and don’t be afraid to take a pit stop to rest along the way. 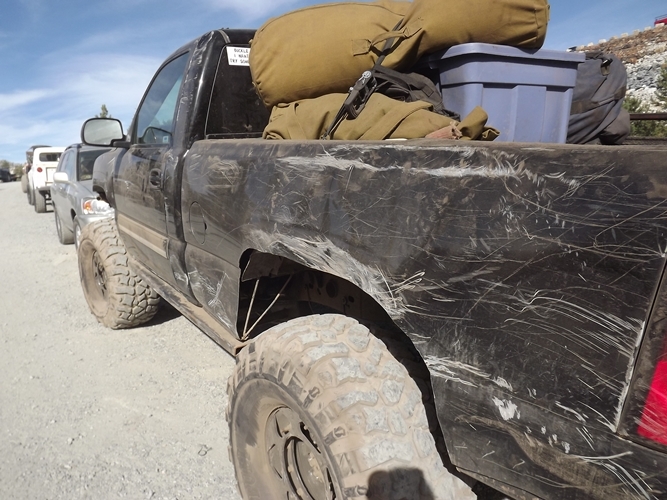 You have to dip your tires if there is water nearby, it’s a RECON G6 rule. This was the scariest part of the RECON G6. I saw a couple kits take a tumble into the water down there. Skeeno Jr and RC Chick took it slow. Once away from the lake, the terrain greened up a bit. 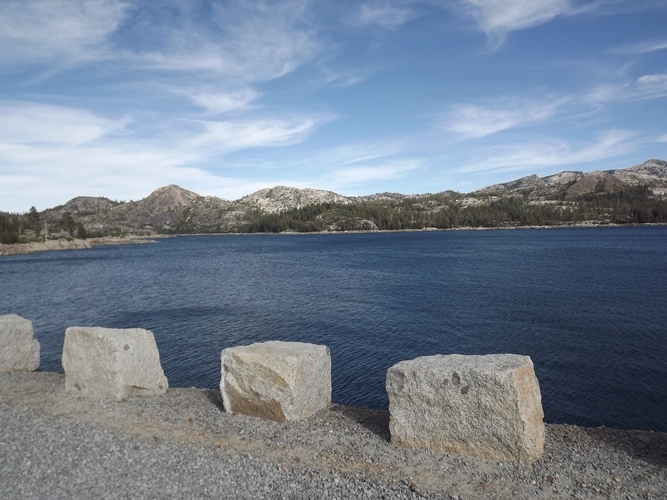 It was definitely a scenic walk/drive. Elio and Dan W showed up and loaned me a battery. Thanks guys for helping me finish. Remember, Finishing a RECON G6 is like Winning a RECON G6. 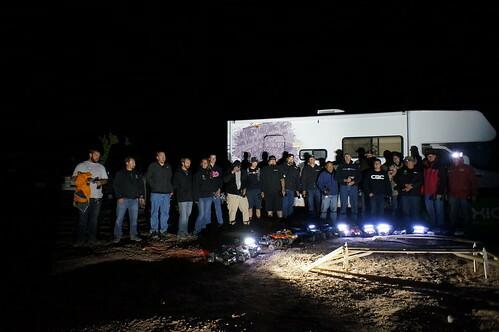 The new owners of CKRC Crawlers came out. 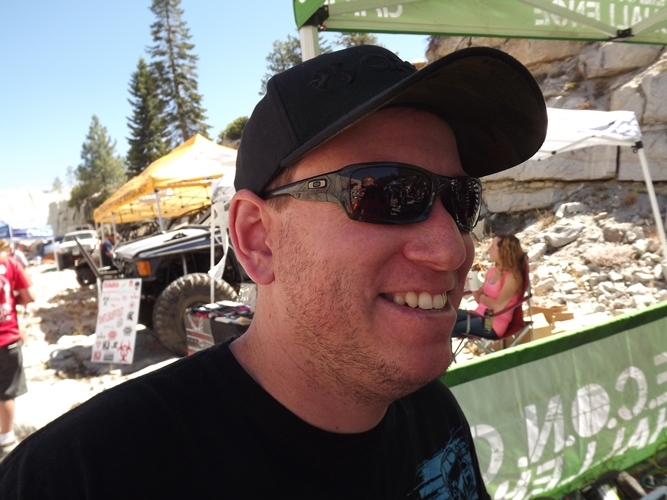 Jason Copeland and his wife Dena are super friendly. This might be the youngest RECON G6er. I didn’t catch her age, but she followed Parker around all day looking for candy. There was a Yeti sighting by G Central. Skeeno Jr hasn’t had a Parker Pickup in a while. 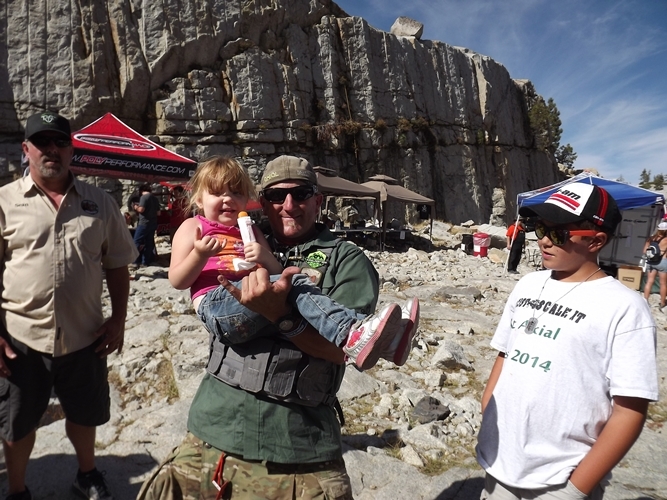 She was excited to win her BPC limiting straps. 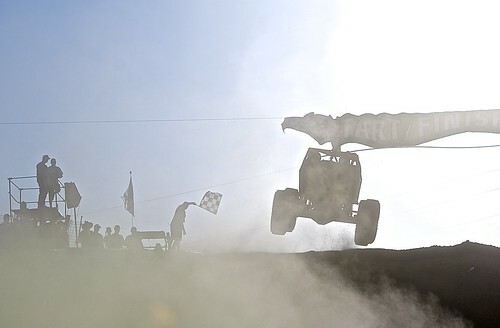 The Drivers of the Day took home some cool skulls for trophies. 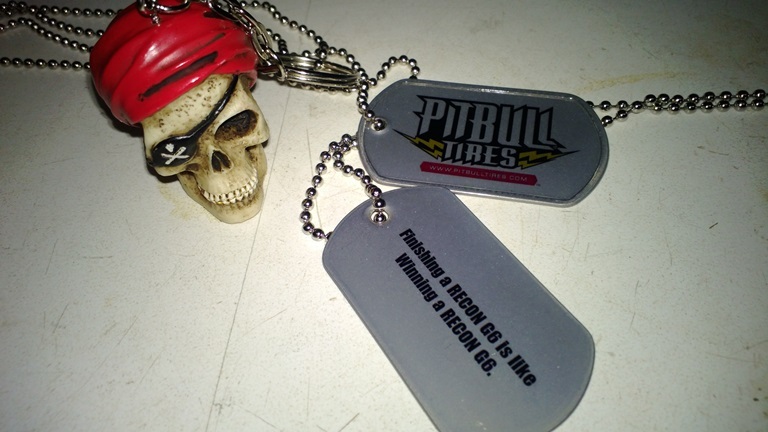 Skeeno Jr put hers on her Pit Bull finishing tag.